“We’ve got your book” the brochure for the U-King’s MFA program promises, and they mean that literally. 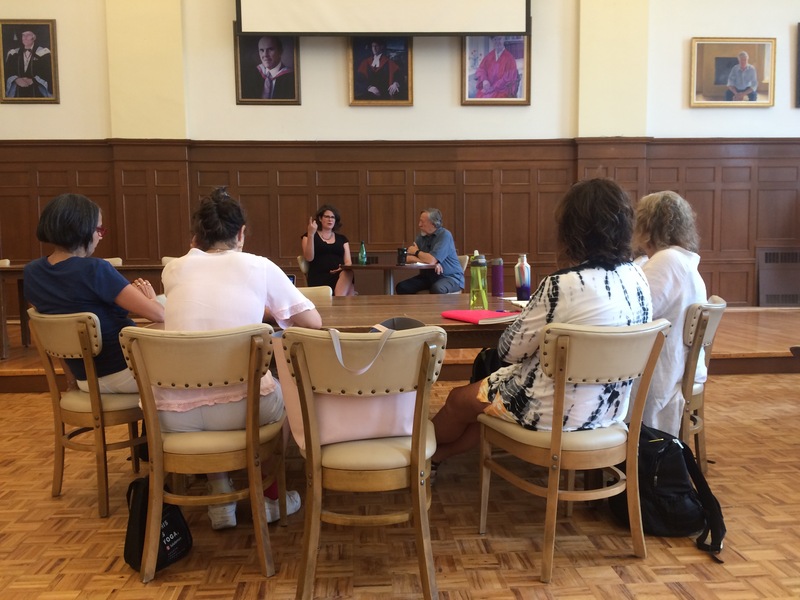 Everyone studying here is writing one, everyone teaching here has written one (or more), and all we talk about from morning coffee to evening drinks in the Ward Room is books–your book, my book, this book, that book. Upshot: 3 visits to the U-Kings bookstore and counting. All but the bottom two were written by U-Kings graduates. 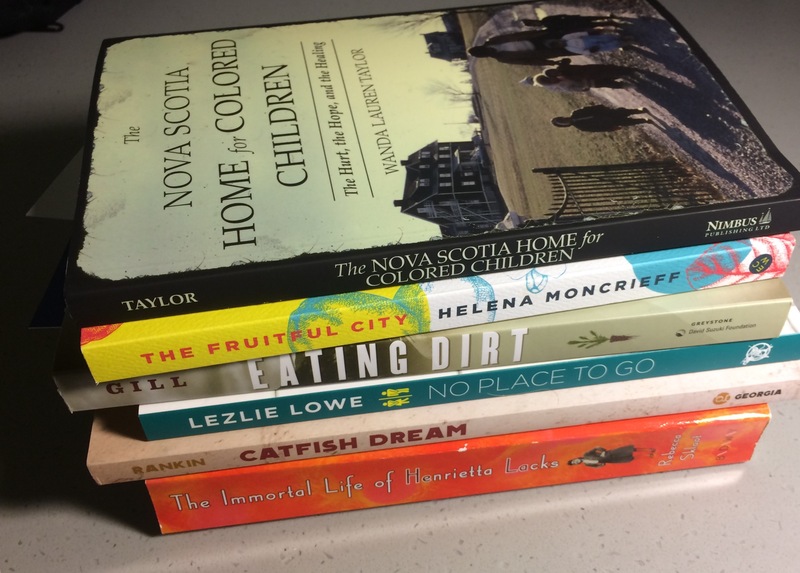 The Nova Scotia Home for Colored Children is an oral history/personal history. The Fruitful City is about urban gleaners who ask the question: Can neglected city-grown fruit address hunger, waste, and food illiteracy? Eating Dirt takes us on the forest road with the tree-planting tribe of Canada’s west coast, while No Place to Go shows us how far we have to go to achieve potty parity–the author’s phrase–for all. Catfish Dreams I was reading as I came here-it’s a story similar to the one I’m working on (about soul food entrepreneurship) and published by the press that would be my “reach school” if this were college, not publishing I’m trying to get into. The Immortal Life of Henrietta Lacks went on my must-read list after mentor Harry Thurston mentioned it in a workshop. Why? “A privileged white woman writes about an African American working-class woman,” Harry said. I’m trying to achieve a similar cross-cultural acceptance by my subjects, for my book. What are some takeaways from Week 1 in the classroom? With your narrator, you’re building a persona. How is he/she coming across? Your book proposal is a living document, like your CV/resume. You’ll be pulling from & adapting your master version the rest of your writing life. Vocabulary! Semantics vs. prosody–the meaning of what you say vs. the way you say it, the rhythm and sound of your words. Wait til I work those into a sentence–I’ll sound like a real grad student!! Go where the events you’re writing about happened. There is no substitute, even if the events happened 400 years ago. Place speaks. Ask: How will your reader be changed by this? Two and a half more days of this, and so to home, to start on MFA Year 2. And reading that stack of books. The author, looking into her brilliant future. 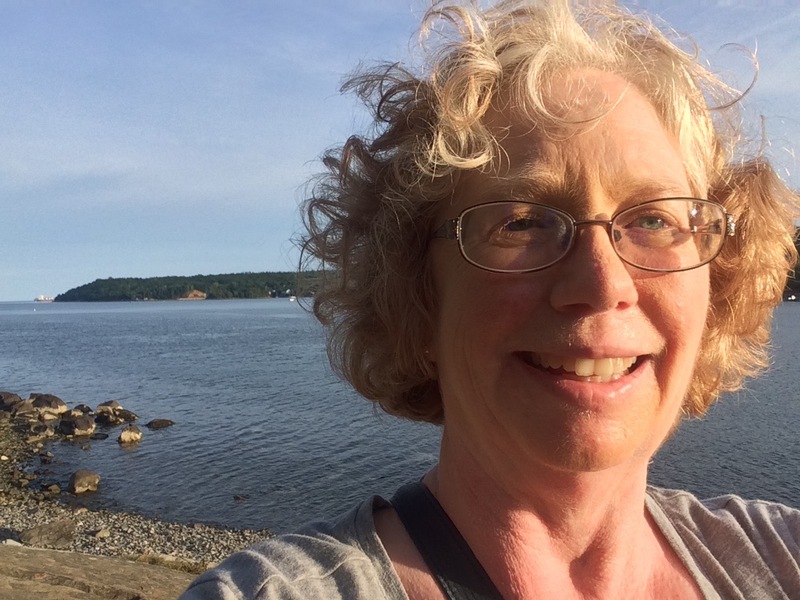 This entry was posted in Sarah's memoir and tagged #mfa, travel. Bookmark the permalink. Congratulations on finishing your first week of your new future. Sarah, loved your update. You sound inspired and motivated. Thanks for taking us, your readers, on this journey with you!